Janet Gonzalez-Mena, MA, is a highly respected early childhood consultant, trainer, infant specialist, diversity specialist, and writer. She taught in the California community college system for more than thirty years and is currently part of the faculty for WestEd's Program for Infant Toddler Care (PITC) and Beginning Together, a training program for adults working with children with special needs. She is the author of Diversity in Early Care and Education: Honoring Differences; 50 Strategies for Working with and Communicating with Diverse Families; Infants, Toddlers, and Caregivers, Ninth Edition; and Basics of Developmentally Appropriate Practice: An Introduction for Teachers of Infants and Toddlers. Janet has a master in arts degree in human development from Pacific Oaks College. Four dynamic leaders in early childhood share their insights and advice on a dozen professional development topics. 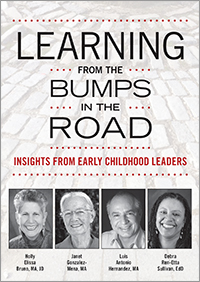 Learning from the Bumps in the Road is a unique compilation of conversational essays that will prompt you to reflect on and strengthen your skills and abilities as you work with children, families, and colleagues. Topics include social-emotional competence, building relationships that support children, diversity and multicultural readiness, overcoming self-doubt, intentionality, power imbalances, technology, and curriculum and assessment.